There are two types of pacemaker - single chamber or dual chamber pacemakers. In both single and dual chamber pacemakers there is a battery, which is placed under the skin connected to one or two leads, which are then placed in the chambers on the right side of the heart. The pacemaker is then able to record whether the heart rhythm is normal or not and can stimulate the heart if the heart rate is too slow. Pacemakers are implanted under a local anaesthetic with some sedation. They are placed under the skin mostly on the left side of the chest. 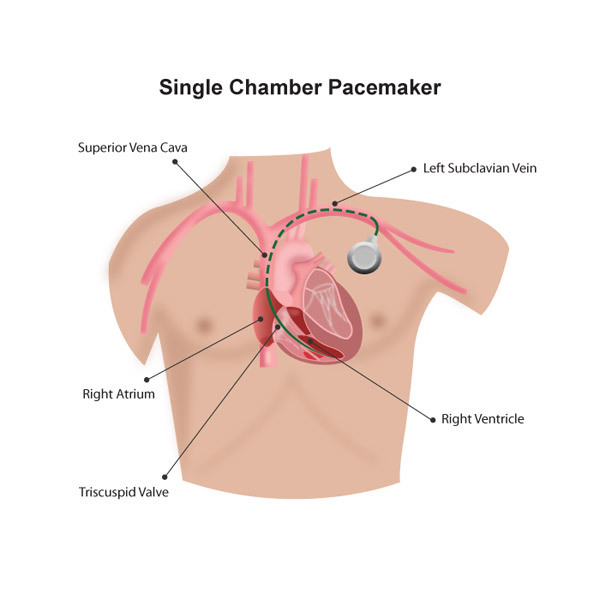 Pacemaker - A pacemaker consists of a battery (generator) connected to insulated electrical leads that are passed through a large vein to the heart. 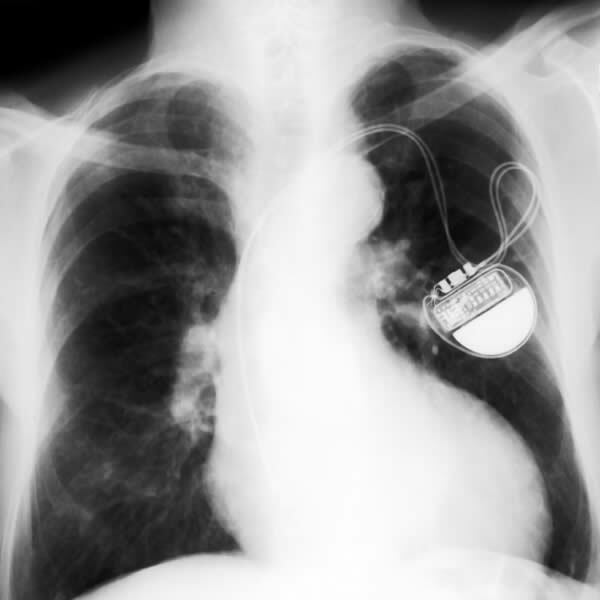 Pacemaker Chest X-Ray - This shows the position of a pacemaker in the chest. 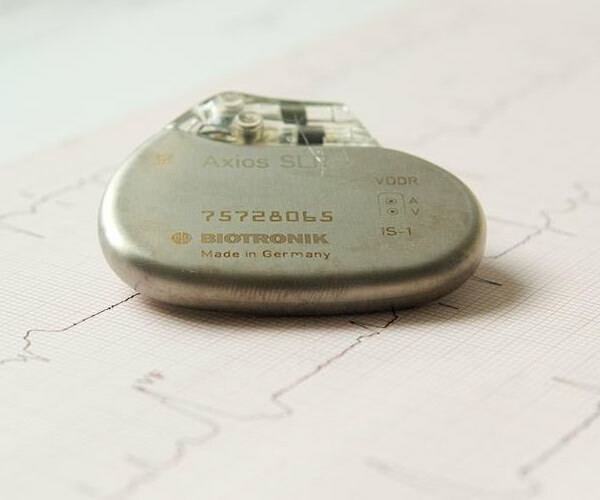 Is putting in a pacemaker safe? There are some complications associated with implanting a pacemaker but these are rare and listed on the advice sheet (see opposite). Generally patients are in hospital for 48 hours and recovery is very quick. 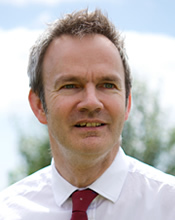 Most patients are quite fearful of having a pacemaker but, it is often life changing. There are some precautions that need to be taken after the implant which include avoiding lifting the arm on the side of the implant for a period of 4 weeks. It is not possible to drive for a week after the implant and this is the advice issued by the DVLA. The pacemaker is normally checked the day after the procedure and again in 6 months and thereafter normally on an annual basis depending on the complexity of the device. Are there any special precautions required after a pacemaker has been fitted? When using a mobile phone it is prudent to use this on the opposite side to the pacemaker. A pacemaker can sometimes trigger airport security systems. It is generally advised that if you are entering shops or libraries you should walk straight through the security system and not linger. It is unlikely, however, to cause a problem with your pacemaker. General household devices do not interfere with the pacemaker.